Rhydian is a classically trained baritone, crossover artist, actor and television presenter who has sold in excess of one million records worldwide. He was the runaway star of ITV's The X Factor, showcasing his incredible vocal range with show-stopping performances from a full theatrical account of The Phantom of the Opera, to putting a classical spin on Pink's 'Get the Party Started' , to reducing the judges to tears with his version of 'Somewhere'. Duetting with Katherine Jenkins in the final, he became the audience favourite, and, despite being runner-up. Simon Cowell swiftly signed him to Sony BMG the very next day. His debut eponymous album was released to critical acclaim and. proving his ever-growing popularity, became the highest-selling album by a male newcomer, going double platinum in the UK alone and selling in excess of 600,000 copies. In the same year, he entertained an audience of over 30,000 at Sir Andrew Lloyd Webber's 60th birthday party in London's Hyde Park, and HRH Prince Charles invited him to become an ambassador of the Prince's Trust. Off the back of his growing success. Rhydian embarked on a 27-date sell-out UK solo tour, proving his versatility as a vocalist and performer, and proving the perfect platform to showcase eagerly anticipated tracks from his second album. O Fortuna continued his success by being certified gold in the UK within two months of its release and included collaborations with Kiri Te Kanawa and Bryn Terfel. The album was met with astounding reviews and was nominated for Best Album at the Classical BRIT Awards 2010. In the same year, Rhydian's career broadened to incorporate musical theatre when he starred as Parson Nathaniel in the sell-out production of Jeff Wayne's eagerly awaited The War of the Worlds. Rhydian starred in three galas at London's Royal Albert Hall. Two of them were classical - the Classic FM Live concert and the Classical BRIT Awards - and the third. Classic Response, for charity. In addition, he performed as a special guest performer in Hayley Westenra's Christmas Wishes at Birmingham's Symphony Hall and in Christmas concerts at the Barbican Hall and the O2 Arena. London. He performed a sell-out 2011 Christmas special at Bath Forum and performed at the opening ceremony for the Ryder Cup. His third album. Waves, was released in 2011 and was a risky departure from his pop opera roots. It saw him move into synth-heavy 80s-inspired pop music, covering much-loved 80s hits along with original songs. The risk paid off and he was met again with critical acclaim. Continuing in his quest to diversify, he went on to appear as Khashoggi in the smash-hit musical We Will Rock You in its UK tour, and took the role of Teen Angel in the musical Grease. Rhydian has performed at almost every arena and concert venue around the UK with some of the world's biggest artists including: the Stereophonies, Sugababes, Charlotte Church, Celine Dion, Bryn Terfel. Girls Aloud, Michael Bublé and Dame Kiri Te Kanawa. For the BBC, Rhydian has guest presented Songs of Praise and, for S4C, he fronted a one-off special of A Night With.... which was followed by a documentary charting his rise as a performer, titled Rhydian: One Year On. In late 2011, Rhydian fronted a nine-part television entertainment series for S4C, featuring, among its guest stars. Hayley Westenra and Ruthie Henshall, which tied in with the release of his fourth studio album. Welsh Songs: Caneuon Cymraeg, featuring songs from his television show. 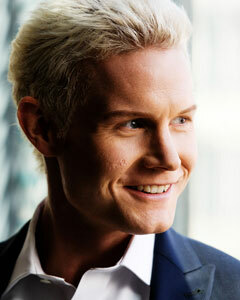 Follow Rhydian on twitter: @RhydianMusic or on his website: www.rhydianroberts.com. Please note: Rhydian will play the role of Rocky on 8th -13th, July at the Cardiff New Theatre and 19th - 24th August at the Bristol Hippodrome.